The tiny klipspringer is named for its ability to leap from rock to rock as if it has springs attached to its hooves. Klipspringers have a rich grey-brown fur color that covers their quite stocky bodies from the front of their face to their short tails, all the same shade. As with most species of antelope, their abdomen, rump and chest are a white color as appose to the color of their coat. They have small eyes and faces and are more agile than their build makes them seem. They reach sizes of up to 60cm in length and 18kg (40lb) in weight, but on average males are around 49-52cm tall and weigh 10,6kg (23,3lb) compared to the much larger 50 -53,5cm and 13,2kg (29lb) females average on. Klipspringers can be found over the many borders and within many hills and mountains. From the Western Cape Province up through the Namib desert on the western side of Africa, while on the east from Northern South Africa around the Kruger, right up to the mountains of Ethiopia, going through Mozambique, Zimbabwe, Tanzania and Kenya in the way. There are also scattered populations within Nigeria, the Drakensberg Mountains and at the end of the Namib Desert in Southern Angola. These ‘rock jumpers’ as their name is translated, occur in most highland areas within Sub-Saharan Africa, around the rainforest where they are less comfortable and not found at all. These rock jumping antelopes are in no current harm as a species. They have many healthy populations and an overall population of 40 000, although this number might more easily change and is less stable due to the fact that a mere 25% of the total population of these Klipspringers falls within protected areas within Africa. Their strongest populations are found in the highland areas of Ethiopia where over 4000 individuals can be found on rocks in the sun, or browsing on local vegetation, not having to compete with domestic livestock like many other antelope species. Klipspringers are very much rock and mountain dwellers. They prefer areas of rocky, mountainous terrain, as long as there is a steady supply of food locally available, but sometimes travel as far as 500m in search of sprouts or grass to feed on. Their skill set when it comes to moving around on the big boulders that make up most of the terrain and the smaller rocks that may slip loose puts them in a prime position when scurrying away from predators. Water isn’t a problem for these creatures who consume enough moisture in the form of food to be able to survive, but definitely won’t turn down a drink when a water supply appears. Klipspringers live in pairs that mate for life, in a conjoined territory in which they live. These territory sizes differ depending on the overall population density of Klipspringers in an area, which is affected by the availability of food, rainfall, temperatures and predator populations in the area. In the Ethiopian mountains where the population density is at its peak the average territory size is a minute 9 ha or 0,09 square kilometers, while in the Northern Cape Province of South Africa, where there is a vast spectrum of land available for foraging and living , the average territory size is 49 ha or 0,49 square kilometers. Klipspringers are predominantly nocturnal and more active on nights when the moon is brightest, resting during the hot hours of the day and deep in the last hours of the night. They like to bask in on rocks in the sun during the day, baking and warming their bodies as a form of relaxation. They also practice monogamy within their relationship to the extant most happily married couples do. They tend to stay within a 5 meter radius of one another at all times, and take turns feeding while the other keeps an eye out for predators. They also spend lots of time on maintaining their territory and, like Steenboks and Oribis, by secreting a black substance from certain glands. They exchange greetings by rubbing their cheeks against one another. Klipspringers take the seasonal breeding approach although they can mate year round. 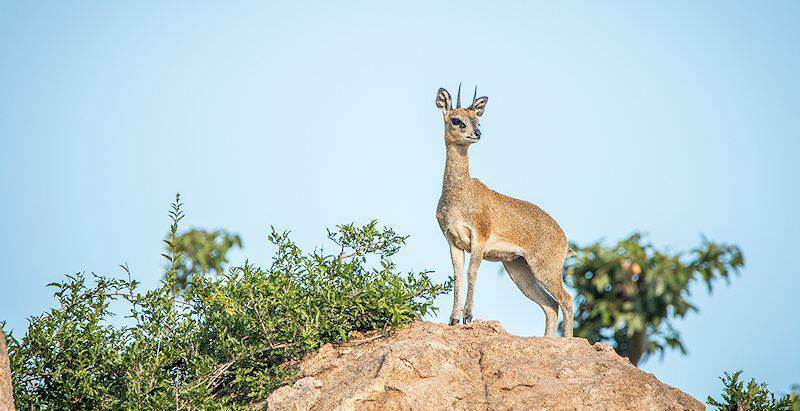 Births peak in late spring or early summer, when most Klipspringer mothers reached the end of their 6 month long pregnancy period, and see their adorable young, only 1kg (2,2lb) in weight, for the very first time. This process begins when both sexes reach sexual maturity, and this happens around 1 year of age among females, with males, as always, taking slightly longer to mature sexually. Their courtship is thought to be more complex than other small antelope and a full study thereof has yet to be published, but they have been observed circling one another and engaging in the same type of physical acts such as the lifting of the foreleg by the male. Klipspringers almost always spot predators on the prowl, due to the fact that pairs are together virtually all the time with at least one keeping a lookout at all times. When a predator wonders into the sight of one of these antelope, their immediate reaction is to flee and give out a call to others nearby, informing them of the presence of danger. After they have run out of the company of the carnivore in question, they usually look back to see if it’s gone, if not, another warning call is given out. Travel to South Africa for the ultimate comprehensive African vacation. Botswana is one of Africa's premier safari destinations, replete with wildlife. Namibia is known for its unique safari areas, like Etosha National Park. Travel to Zambia for an authentic safari experience in a pristine wilderness. Zimbabwe is known for its off-the-beaten-track safari areas and Victoria Falls. Mozambique is a tropical paradise of pristine coral reefs and fine beaches. The Kruger National Park is South Africa's top safari destination, offering incomparable game viewing opportunities. The Sabi Sand Private Game Reserve is renowned for hosting some of the continent's most lavish lodges, from Lion Sands to Leopard Hills. Cape Town is South Africa's top tour destination, home to popular sites like Table Mountain and Boulders Beach. The Garden Route is sought-after by leisure lovers and adrenalin junkies alike, catering superbly to all types of travelers.